Here is the interview I did with Terry Tempest Williams for the OR Show Daily. She spoke at the Conservation Alliance breakfast and brought the crowd to tears. She’s truly something more than a writer—a philosopher, an activist, an icon, but most of all a gracious and chivalrous person. 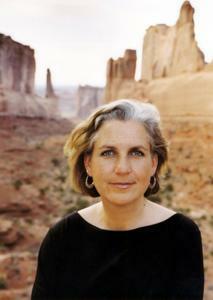 Terry Tempest Williams has become the moral and spiritual compass for the American conservation movement. Her enormously popular books, including Refuge: An Unnatural History of Family and Place, Red: Patience and Passion in the Desert, and The Open Space of Democracy, explore complex interconnections between wild lands and human destiny. Ever outspoken, she is a strong proponent for Utah’s Redrock Wilderness, the Arctic National Wildlife Refuge and the importance of wild places to our culture. We talked to her about her new book Mosaic: Finding Beauty in a Broken World (due out later in 2007) and what she hopes to convey to the outdoor industry. Your new book deals with your experiences in Rwanda. Can you tell us about that? I was in Rwanda in the fall of 2005 with a Chinese-American artist named Lily Yeh who is a community artist. She’s a mosaicist and for years she was the director of the Village of Arts and Humanities, based in a very tough neighborhood In Philadelphia. Basically, she, along with extraordinary members of the community, took a ravaged urban landscape and created public gardens, community theatre, beautiful murals on the sides of broken buildings. It really transformed a place of deep despair into one of hope and beauty. Then she met a Rwandan named John Bosco. She heard the story of that country’s genocide [in which at least 500,000 people died in 100 days in 1994] and was deeply moved. She said “how can I help?” and he said you can help us create a genocide memorial for this survivors village. So she went to Rwanda and asked if I would be her scribe. I was a transformative experience—difficult, heartbreaking, soul-inspiriting. It encompassed a full range of emotion. Talk about a mosaic, it was a mosaic of both brokenness and beauty. And you have incorporated those experiences into the book? It’s one section. There’s another section on prairie dogs and another section on Byzantine mosaics in Italy and another section on environmental humanities. The book itself is a mosaic. After September 11, all of us were wondering about this broken State. Democracy as I knew it was not what I was seeing. I found myself being very outspoken. I found myself speaking out in ways that were not safe and in tough situations of censorship. But, I realized that my rhetoric had been as brittle as the rhetoric I was opposing. In September 2002, I was in Maine, and I remember going out to the coast to this one particular rock. I remember asking the ocean to give me one wild word, just one wild word that would carry me to a place of poetry again, and after a long silence the word that came back to me was mosaic. Mosaic? What does that mean? We’re seeing fragmentation in every aspect of our lives, both personally and collectively—whether it’s climate change, whether it’s how we manage our time. We’re seeing this kind of fragmentation in our government, War is a state of fragmentation. If we can embrace an ecological mind, then we can begin to bring these fragments, these tesserae, these pieces of the mosaic together into a larger picture. I was thinking, “How does this relate to the outdoor recreation industry?” The image that I have is when we were in this genocide survivors village in Rwanda, right on the edge of the Congo, we saw these two orphans standing in the center of the village. One was wearing a Patagonia and the other was wearing a North Face, For us in this privileged place of the Untied States, in this privileged profession of outdoor gear and recreation, I think that image tells a story that out concerns can no longer simply be local. What we think about, the decisions that we make and the community we create has these concentric circles that reach even into a genocide survivors village in Rwanda. There has been a lot of talk at the show about doing something about global climate change. What are your thoughts on that issue? I’m seeing climate change not only as an ecological issue, a political issue, a social issue (as we saw with Hurricane Katrina)—I also see it as a philosophical issue. We really are engaged in a climate change philosophically. I think that has to do with seeing the impact of community and the concentric circles of community and how they radiate out into the world. So when you look at the outdoor industry I see the impact they had on Utah with Peter Metcalf of Black Diamond and others who said, “You know, wilderness matters [when the OIA threatened to pull the show from Salt Lake City because of then-governor Leavitt’s opposition to roadless lands in 2003]. They said, “It’s a local issue. It’s a state issue.” It created national awareness. I look at the support the Conservation Alliance gave us in Castle Valley [when it helped the local Castle Rock Collaboration halt development around Castleton Tower]. That was a local issue, and yet, because of that support early on, we now have a bill before Congress that would set aside 4,000 acres in a land exchange. How can the outdoor industry continue to have an effect on these large social and political issues? I just have so much respect for the tradition of this gathering and who is behind it. You think about real visionaries like Yvon Chouinard and Eric Reynolds. The potential is so huge for what could happen here in terms of social change. A lot of people say that this gathering [the Outdoor Retailer show] is about clothing. This is about gear. I disagree. Yes, it’s about clothing. Yes, it’s about technology and extraordinary equipment, but it’s really about a philosophy and a belief in wild places and what is at the heart of wildness. What do you think Henry David Thoreau meant when he said, “in wilderness is the preservation of the world”? Do you have hope then for the future? On a fundamental level, I buried my hope in Rwanda. The issues we saw in terms of poverty and illness and violence were so overwhelming, it was hard for me to even see any hope. What I did leave with was a tremendous sense of faith, which I find very different that hope. Hope often feels like it is attached to our own desires, faith is more open-ended. I saw what a few people can accomplish together through hard work and a belief in the transformative power of art. In many ways, art is related to faith. Coming out of a Mormon tradition, I think of my great-grandmother who said, “faith without works is dead.” If I were to say that I do have hope I think that’s where it is based—in love put into action. I think we see that in the conservation movement, in our relationship to public lands and wilderness. It comes down to the question of “what are we in the service of?” And I think that is a question that we can all ask even as we are attending Outdoor Retailer. I mean, what are we in the service of? Is it commerce? Is it the wild? Is it community? How do we make these connections to something larger than ourselves? What are you in the service of? I think if we can ask the question then the answers follow. I hope I’m in the service of a wild heart. I hope I’m in the service of others. I hope I’m in the service of beauty. I think all of us hope to be in the service of some truth larger than ourselves.